Established in the year 2004, we, 'M. D. Steels Pvt. Ltd.,'are one of the renowned manufacturers and exporters of a wide range of High Alloy Centrifugal and Static Castings including abrasion resistant liners, radiant tubes, furnace rollers, stabilizer roll, hearth rolls, etc. Manufactured using superior quality steel or sand molds, all these castings are widely appreciated by our clients for durability and dimensional accuracy. We design these castings as per emerging market demands and offer these in various customized sizes & specifications. Developed under the close supervision of our experienced professionals, these casting are extensively used in aerospace, marine, and power transmission industries. For manufacturing these casting, we are supported by a well developed infrastructure that helps us in carrying out advanced centrifugal casting processes and casting procedures. At this infrastructure, we have installed all requisite tools and equipment, which allow us to test the quality of these castings. 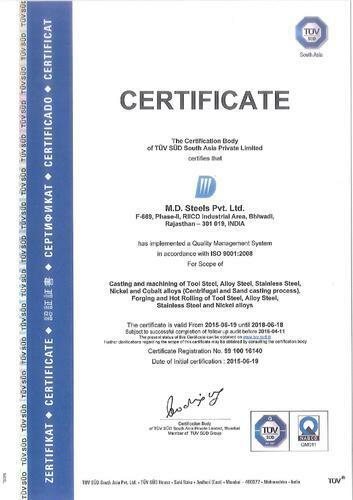 Moreover, to ensure optimum quality, we also conduct radiography, ultrasonic, magnetic particles, and other NDT tests through third party organizations. Under the able guidance of our mentor Mr. Anand Behrani, we have carved a niche for ourselves. He has an extensive industry experience and in-depth knowledge about the market, which helps us in providing a superior range of High Alloy Centrifugal and Static Castings and highly competitive deals to our clients. By focusing of advanced technologies, know how, energy efficiency and constant process development via automation and robotics and human resource development, training and nurturing a culture of innovation and constant change towards improvement. We are one of the leading names engaged in manufacturing and exporting a wide range of High Alloy Centrifugal and Static Castings. Our range includes Centrifugal Casting, Stainless Steel Casting, Heat Resistant Castings, Radiant Tubes, Furnace Rollers and Sink Roll. We also offer Hearth Rolls, Stabilizer Roll, Tube for Sponge Iron Plant, Gas Plant Retort, Abrasion Resistant Liners, and Heat Treatment Trays & fixture to our clients. Fabricated in accordance with the international casting standards and specifications, these castings are extensively used in aerospace, marine, and power transmission industries. These castings are stringently tested on well-defined parameters before being supplied to the clients. In order to meet the specific requirements of our clients, we offer these casting in various customized sizes and specifications. We cast various high alloy grades like HF, HK, HP, HU, HT, IN519 and 316l. Our typical low alloy grades are EN18 Stainless Steel Casting, EN19, and EN24. Our static cast work rolls and centrifugal cast work roll sleeves are used for hot rolling of various material. The typical roll grades we cast are Adamite Steel and high Chrome Steel.